We’ve got a lot to celebrate right now. A few weeks ago I hit a wall. My weight loss had plateaued for a month and a half and I was feeling frustrated. One bad night of pain and cramps and no sleep (which happens less frequently these days) had me missing church and a party for a dear friend the next day. That combo had me in tears and feeling so defeated, I found myself questioning all this crazy effort. Was this diet lifestyle worth it? Was it actually healing me? Was it really even possible to get these tumors inside me to stop growing through *diet* alone? That just sounds crazy. Who were we kidding? We had changed practically everything about our lives and what kind of miracle, exactly, were we expecting? I laid in bed, crying that afternoon. A few tears came from the physical pain I was in, but mostly I was having a nasty little self pity party. Woe is me. Steve held me and rubbed my back. He prayed for us as my bitter tears flowed. He asked God for more patience, more faith, more courage, more peace. Eventually I fell asleep. When I woke up the world felt a little better, but I knew that what I needed was more than a nap. A few days later, we got more encouragement than we had imagined possible at this stage. I had a new ultrasound done the week before, to monitor the masses on my ovaries and uterus. I have a history of endometriosis and had major surgery to remove some huge suckers in January of 2012. Just a few months later I had new nasties growing in there again. As of this past September there were two complex cysts causing havoc again, and at least one of them seemed to be getting bigger at a pretty rapid pace. The doctors are pretty certain that these masses are endometriomas, just like the last ones. In September they told me (for the thousandth time) that there’s nothing you can really do to get rid of these things. They would prescribe me narcotic pain meds to help me manage when the pain is out of control, and another surgery when the masses get super big again (and they would). They have also said that if I go in for another surgery, I should prepare myself for a partial or total hysterectomy (at the ripe old age of thirty-one). As a result of all this, I need to monitor these masses every few months by ultrasound, and I was overdue for a check. The results came in. Here’s what they found: One of my tumors had disappeared. DIS.AP.PEARED. The other one, the larger one, is measuring 20% smaller. SMALLER. That’s plenty of encouragement right there, don’t you think? But wait, there’s more! This week my weight loss plateau ended, and another five pounds bit the dust. That brings my weight loss total to NINETY-FIVE POUNDS. That’s a small person - I’ve lost a person!! We are more focused on healing our guts and eating good food, and less focused on the scale. We’ve been eating plenty of bone broth, and burgers, and fish, and raw cheese, and salads with olive oil dressings, and homemade pickles, and roasted veggies, and pastured eggs with bright orange yolks, and plenty of avocados, and bacon. We feel better. We are looking so much better. And we are so thankful. God’s grace abounds. Clearly, there is still work to be done, but there’s plenty of evidence that our guts are healing and that we’re on our way to great health. We’d both like to lose a bit more, and we will work and pray to continue seeing positive changes. We don’t know what God has in store on the road ahead, but we are pushing forward, knowing that the way is shored up. So, let's celebrate! Pull up a chair, grab a cup of tea, and sit around our table. We'll give you cake. 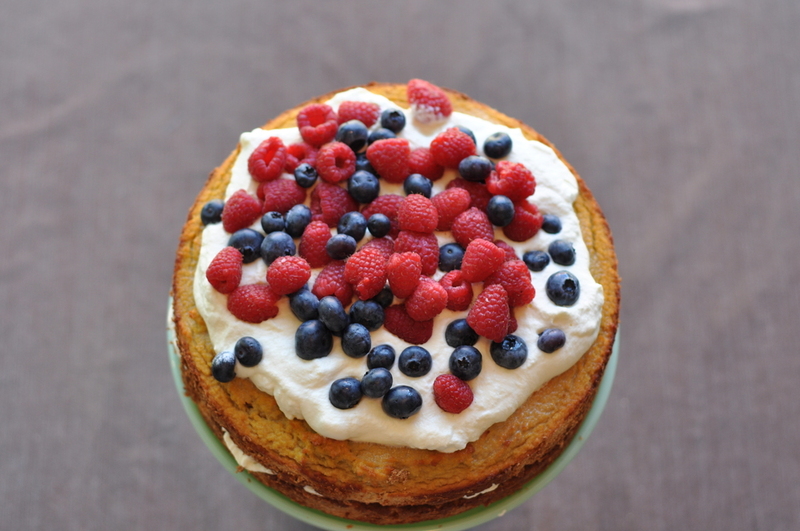 This is cake we don’t have to feel guilty about. It’s packed with nutrition and zero refined sugars. Wahoo! 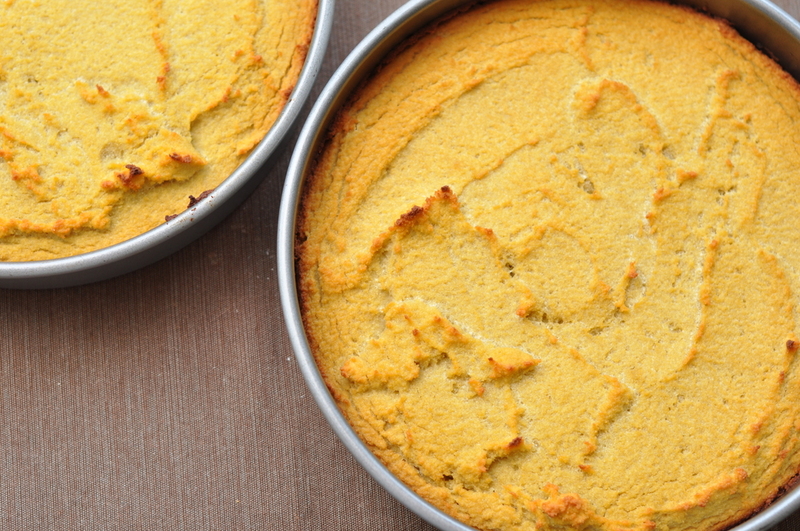 Thanks goes to Kendahl at Our Nourishing Roots for doing the legwork and making this recipe for Yellow Coconut Cake, and then sharing it with the world! Also, so glad to have supportive people in our lives, like my wonderful mother-in-law, who found Kendahl's site and recipe online, and made GAPS cake for us in the first place. Thanks, Mom C! Preheat oven to 350 F. Grease 2 eight inch, round cake pans and line with parchment circles, cut to fit the pans. Set aside. In a large bowl mix eggs, milk, honey, and vanilla together until completely blended and smooth. In a separate bowl, whisk coconut flour, baking soda, and salt together to get out as many lumps as possible. Add the dry ingredients to the wet ingredients and combine very thoroughly with a mixer. Pour into the prepared pans and bake for about 40 minutes, or until slightly browned on the edges and the cake pulls away from the sides of the cake pan. 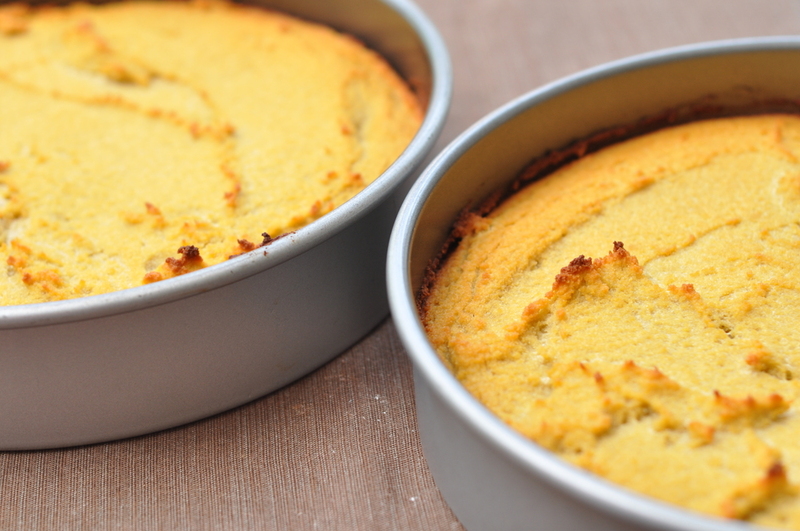 Place the cakes on cooling racks until completely cool before you loosen them from their pans. 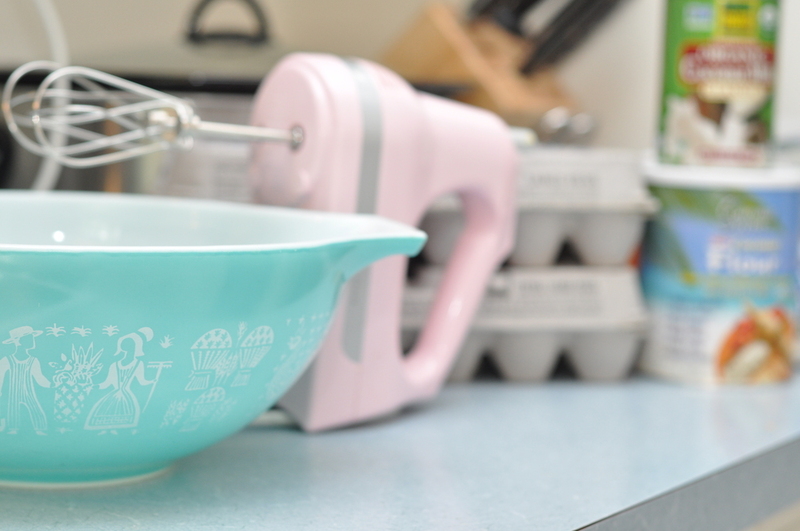 Run a knife around the edge and carefully turn the cake pan over until the cake comes out. Assemble by placing one cake on a plate, spreading with “frosting” of your choice (I used honey-whipped cream here), and stacking the second cake directly on top. 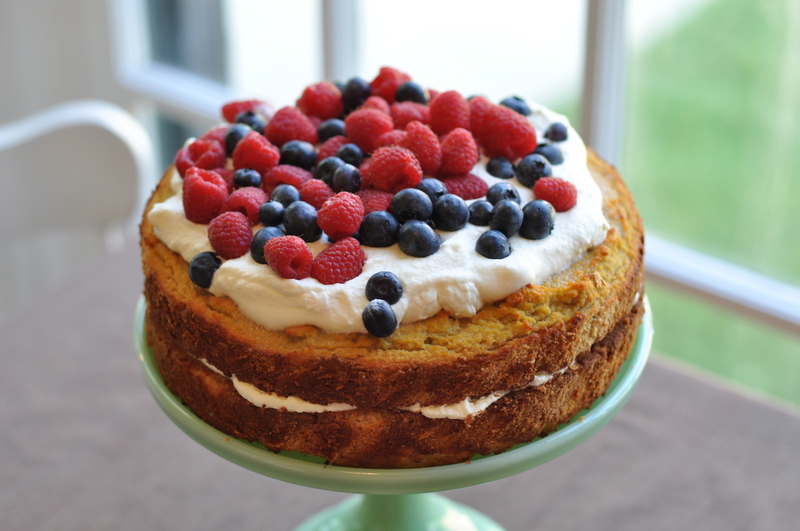 Frost the entire cake, or top with goodies like more whipped cream and berries. A few tips: Ingredients matter. For coconut flour, I recommend using Coconut Secret Brand, raw, organic coconut flour. For coconut milk, I recommend using Native Forest, Organic Coconut Milk (it comes in a BPA free can). The cake is dairy free as is. You can keep it all dairy free by making a coconut milk frosting.